Pokerati » Blog Archive » Can Tom Dwan (and Phil Ivey) Save China? Can Tom Dwan (and Phil Ivey) Save China? 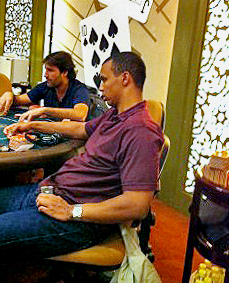 Phil Ivey playing at the Galaxy/Starworld’s Poker King Club in Macau. As the WSOP got underway in Vegas, one question kept surfacing: Where’s Tom Dwan? Up until June 26, well into the WSOP schedule, Dwan was where he had been for the last six months: Macau. Dwan, aka durrrr. has grossed more than $2 million in tournaments, but he is best known for his cash game play at nosebleed stakes. Before Black Friday, most of those games were online. Since then, Galaxy Entertainment’s StarWorld Hotel’s Poker King Club in Macau has been host to the highest stakes games. As reported in PokerPortal Asia, Dwan won $3.8 million on a single hand on May 8 there. In March, Sam Trickett dragged a $2 million pot in Macau. Courting Tom Dwan — and high stakes poker players like Dwan — is important for Macau, especially in light of the data from the Chinese island gambling Mecca. Accoring to this Reuters article, VIP junket wagering contracted in June, the first time that’s happened since 2008. On June 29, AMEX Holdings, once one of the most profitable Macau junket operators, announced it may not survive the downswing. When the junket business gets ugly in Macau, it can get gang war ugly. Last month, junket and casino operator Ng Man-sun was beaten by six men with sticks and hammers — at his own casino. Authorities are hoping it was an isolated incident and not the start of a gang war like those that plagued Macau in the 1990s. Macau gambling revenues have slowed in recent months, missing analysts’ expectations as reported in this Reuters article. Although June’s revenues still grew 12.2%, it’s a far cry from Macau’s 42% revenue growth in 2011. Las Vegas Strip revenues dipped 18% in May according to the latest Nevada State Gaming Control Board report. Up until now, Wynn and Las Vegas Sands have been able to more than offset lackluster Strip revenues with fast growing Macau profits. If the tide is receding in Macau, Wynn and LVS may be among the skinny dippers. Wynn and Las Vegas Sands are due to report their quarterly earnings on July 17 and July 23, respectively.